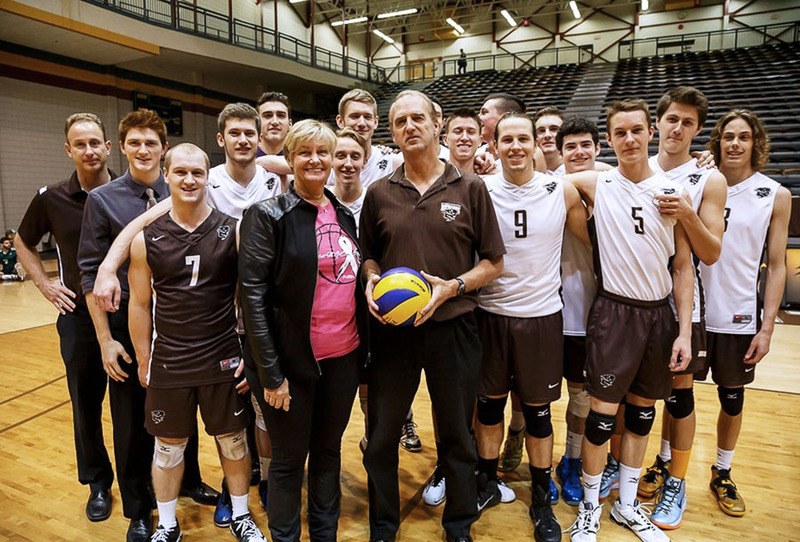 The U of M Bisons men’s volleyball team hosted the University of Alberta Golden Bears on the weekend. Solid play by Owen Schwartz gave the herd hope through back-to-back losses. The Bisons lost a tough battle to the Golden Bears 3-2 on Friday at the Investors Group Athletic Centre. Taryq Sani led the visitors with 20 kills and 10 digs in the match, while the home side was led by Kevin Negus’ 20 kills and Schwartz’s 11 digs. Alberta came out strong in the opening set, hitting at a .652 per cent rate and holding the Bisons to a .118 hitting percentage. The Golden Bears dominated their way to a 25-13 win in the first set. Manitoba regrouped in the second set, winning 25-23. With Alberta leading 14-12, the Bisons scored six consecutive points to take an 18-14 lead. The run was controlled by Negus, who slammed down two kills and served up four aces. Manitoba led for the rest of the set and Dustin Spiring ended it with a kill for the herd. The Bisons were in command again in the third set and hit at a team-high .300 per cent. The herd led for the entire set and Schwartz capped it off with a kill to give Manitoba a 25-17 win. Manitoba was on the brink of victory, up 24-23 in the fourth set, when a Ben Carleton service error tied the game at 24-24. The Golden Bears took a 25-24 lead and won the set on an attack error by Negus, forcing a fifth and final set. The final set went back-and-forth, but the visitors were the better team, hitting at .471 per cent while Manitoba hit at .174 per cent. Alberta was led by Alex McMullin’s four kills in the set and won by a score of 15-13 to take the match. “Both teams were playing really well and the hitters were on cue at the end,” Bisons head coach Garth Pischke told Bison Sports. The Bisons were defeated 3-1 by the Golden Bears on Saturday, completing Alberta’s weekend sweep. Alberta was led by Sani and McMullin, both recording a game-high 16 kills, while Manitoba was led by Schwartz’s eight kills and six digs, and Spiring’s seven kills. With Kevin Negus out of the lineup for game two, Schwartz took on an expanded role for Manitoba. “I knew that with Kevin out, I did have to take on a little bit of a bigger role,” said Schwartz. The visiting team attacked hard in the first set. Jackson Kennedy was a focal point for the Bears, connecting on four kills. Alberta spread the ball around and went on to win the opening set 25-16. McMullin came out firing for the Golden Bears in the second set, slamming down four kills in the team’s first five points, helping them to an early 5-1 lead. Manitoba battled back and thanks to a Brendan Warren kill and two errors from Sani, tied the game up at 17. The visitors responded with four straight points and went on to win the set 25-21. The teams battled in the third set and the Bisons were down 11-9 when they strung together four points. Manitoba collected points on three Alberta attacking errors, and Jon Laube smashed down a kill to help the home-side to a 13-11 lead. Manitoba controlled the set from there and won their first set of the match 25-17. Dylan Sutherland was huge for Manitoba in the third set, recording a service ace, the set-winning kill and a monster block that energized the fans in the Investors Group Athletic Centre. With the Golden Bears leading 8-6 early on in the fourth frame, two kills from Kennedy on a 4-0 run put the visitors up 12-6. The Bisons fought back, but the Bears were able to hold on to take the set 25-21 and the match 3-1. The Bisons will be in Calgary on Nov. 23 and 24 to take on the University of Calgary Dinos. Tipoff for game one is 8:30 p.m. CST and 6:30 p.m. CST for game two.